According to Pope St. John Paul II, the parish is “the Church living in the midst of the homes of her sons and daughters.” It is the unit of the Church closest to the lives of the people and how they live their faith. Parish life centers around the celebration of the sacraments and the proclamation of the Word in the Liturgy. From that, the parish forms community and goes out in service. The parish is a place where people need to be evangelized and re-evangelized, but every parish has a different culture and dynamic, its own traditions and expectations. The parish is where all the faithful of a locale come together, and many personalities come into play. These many personalities provide potential for an abundance of gifts from the Holy Spirit to build up the Body. The parish can provide for many of our needs, spiritually, socially, and otherwise. People who are highly invested in their parish feel strongly about it. Others are on the fringes. The parish has become a home for many people, something close to their heart and the patterns of their daily life. For some, it is a home primarily because it nourishes their soul. For others, it has become a home primarily because it fills another need in their life. These factors bring a challenge to parish ministry. One cannot simply implement a preset ideal. It has to be in dialogue with the concrete situation of the parish, under the leadership of the pastor. Having served for years in various parishes and positions and having taught on lay ministry at the college level, I was asked to share with you my ten points for effective parish ministry. “Do not be conformed to this world but be transformed by the renewal of your mind, that you may prove what is the will of God, what is good and acceptable and perfect.” (Romans 12:2). Even by being in the presence of God and staying aware of it, we allow our minds to be redirected and see our surroundings in a new way. Jesus went into seclusion to pray before his ministry. For us, the Eucharist nourishes us to go forth and the Mass unites us with the community. Meditation on the Scriptures cleanses our minds and reminds us of God’s plan. Examination of conscience and Reconciliation renew our thoughts and actions. The Rosary brings our needs before the Blessed Mother. Retreats help us refocus our lives and ministry. “An evangelizing community gets involved by word and deed in people’s daily lives; it bridges distances, it is willing to abase itself if necessary, and it embraces human life, touching the suffering flesh of Christ in others. Evangelizers thus take on the ‘smell of the sheep’ and the sheep are willing to hear their voice” (The Joy of the Gospel,24). People are more open to hearing the gospel from people they know and trust. It’s important to build connections and relationships with parishioners, conversing and spending some time with them. We need to be perceptive to their needs, and know the needs of the community so we can effectively reach out. Having built relationships, we need to be comfortable in talking with others about living the faith. In a parish, the faith is assumed, but it’s not automatic that it gets consistently lived out. We need to be comfortable and enthusiastic in talking about it. One way we can do that is by reminding people and our coworkers that we need to pray about our difficulties. People will come forward with situations that need prayer. Sometimes they will ask us to pray, and other times we find an opportunity to ask them if we should bring the situation before the Lord. We could ask them if we could pray with them right then and there. When we pray with people, I’ve found that it’s most important to be intentional about being in God’s presence and confident in his love and mercy. We could also bring their intentions into our prayer later on, or even direct them to request their intention be listed in the petitions at Mass, for someone who is ill or who has died. The needs of the parish are many, and some needs we will simply observe. We in lay ministry are also intercessors, realizing that it is only through God’s grace that these situations can truly be resolved. We must always try to stay focused on what ministry is all about—bringing people to Christ for his glory. But also, we should prayerfully think of what this particular ministry should look like in the future. After the vision has been established, communicate the vision to the group and work towards it, keeping it always in prayer. Often, there is a big gap between the status quo and the vision. It can be daunting to move forward, so it’s a good idea to make a plan for how to get there, in incremental steps. Focus on implementing each step to achieve small successes first and then move forward. Perhaps God will guide the ministry in a different direction along the way, so we should be open to that as well. The pastor is the one entrusted with the care of souls in the parish. He is the head of the parish community, representing Christ, and his guidance, leadership, and support is essential. Typically he needs help in caring for the many needs of a modern parish, and people have come to expect a variety of services from the parish. It is important to meet with the pastor to know his vision and to implement it, or sometimes to dialogue with the pastor towards a vision that he can support. The Church is a unity, so we’ll want to work together with other parish leaders. It helps to work to understand them and their organization. Allow for some give and take, while communicating your vision to them. Show them support when needed, and find ways to help each other. Different input and perspectives helps make for a ministry that is able to reach more people. Out of doing ministry together, friendship and community can grow in a way that is very special. It comes along the way of doing the activity of the parish. Involving others as much as possible is important, but it’s key to have the right people in leadership. One of the big challenges of collaboration is being on the same page in the Faith. Adult faith formation is a great way to form disciples who can then go out and serve. We have to first have faith in order to share it. It’s also important for us to continue growing in our own faith and in skills for ministry. Ascension offers many great studiesthat help adults learn more about the Bible, the Mass, the Church, and Christian living. Done in a welcoming spirit, these workshops form community in the Lord and lasting friendships. They make for truly forming a community of missionary disciples. Many of these studies focus on areas that are often experienced in the life of the Church, but they bring them consciously into focus with depth of understanding. “In all its activities the parish encourages and trains its members to be evangelizers” (The Joy of the Gospel, 28). The Mass, the homily, the parish’s works of service, and so forth, all form us. Yet people especially nowadays often need to come to a deeper understanding of the truth of the mysteries in which we participate. This is even more the case because of the competing voices of the world. “So, whether you eat or drink, or whatever you do, do all to the glory of God.” (1 Corinthians 10:31). Church meetings can start with prayer, even if they aren’t directly about the faith. A groundskeeping committee could begin with a prayer about God’s creation, for example. “God bless you,” or similar words, should be on our lips even in conversations or phone calls that aren’t specifically religious. “If you are offering your gift at the altar, and there remember that your brother has something against you, leave your gift there before the altar and go; first be reconciled to your brother, and then come and offer your gift” (Matthew 5:23-24). Conflict often arises, but this is more often than not because people love their church. Anger is typically the response to a perceived threat. For some people, changing the status quo is a threat to the good they see. If conflict arises in your ministry, try to pause and stay calm. Be assertive but objective. Avoid gossip, but talk directly to the person. Talk about how the behavior affects you, but speak in terms of external behaviors—what is actually going on—never overgeneralizing a person, implying in some way that they are a bad person. We are all children of God and are struggling in different areas. While we stand firm on faith and morals, surely we can be willing to make compromises on practical matters of parish life such as rooms and scheduling. There needs to be a give and a take. It’s easy to focus on the past and how we were right, but we need to rise above that. Think forward to how to resolve the issue in a positive way. “While certainly not the only institution which evangelizes, if the parish proves capable of self-renewal and constant adaptivity, it continues to be ‘the Church living in the midst of the homes of her sons and daughters’. This presumes that it really is in contact with the homes and the lives of its people, and does not become a useless structure out of touch with people or a self-absorbed group made up of a chosen few” (The Joy of the Gospel,28). “Precisely because it possesses great flexibility, [the parish] can assume quite different contours depending on the openness and missionary creativity of the pastor and the community” (The Joy of the Gospel, 28). St. Benedict’s maxim for life in the monastery was ora et labora (pray and work). Living a balanced life helps to ward off burnout, and losing our sense of purpose. In addition to prayer, we also need the support of Christian community, sometimes outside of where we do ministry to provide a safe place to talk about being real about living the Christian life. We need faithful people to encourage us in our walk and to challenge us to grow. Also, we are not meant to constantly work without relaxation. Hobbies and activities have their place too in a balanced life and ministry. “We must admit, though, that the call to review and renew our parishes has not yet sufficed to bring them nearer to people, to make them environments of living communion and participation, and to make them completely mission-oriented” (The Joy of the Gospel, 28). That means we have some work to do, but it must start with ourselves and go out from there. 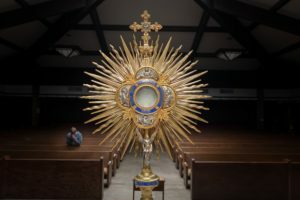 This article was originally published on the Ascension Blog at ascensionpress.com. Photos by Josh Applegate on Unsplash.